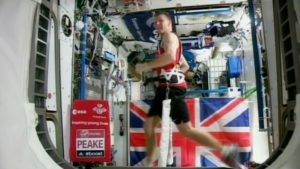 While in London the famous marathon was being run, in the International Spatial Station, the British astronaut Tim Peake decided to run the 42.195 km as well, in a very particular way. Not being able to directly partecipate to the marathon, the major ran on tapis roulant held by elastic bands to fight gravity lack effects, with wieghts on the ankles and on the shoulders, finishing his race in slightly more than 3h35. All of this under the Guinness World Record judge supervision who, after following the live stream of the marathon, officially inserted him in the record book. Tim Peake though, was not the first astronaut to run a marathon in the space; in 2007, in fact, Sunita Williams ran the Boston Marahton in 4h24, even though their times cannot be compared because of different cable setups and weights. During their stay in the space (Peake has already been there for 4 months), astronauts train themselves in order not to excessively compromise the aerobic resistance and the muscular strenght due to lack of gravity. It must have not been easy for the astronaut to run with those weights on for all that time considering that they cause bruises on the shoulders and around the wrist but, despite that, he states to be satisfied by his accomplishment.